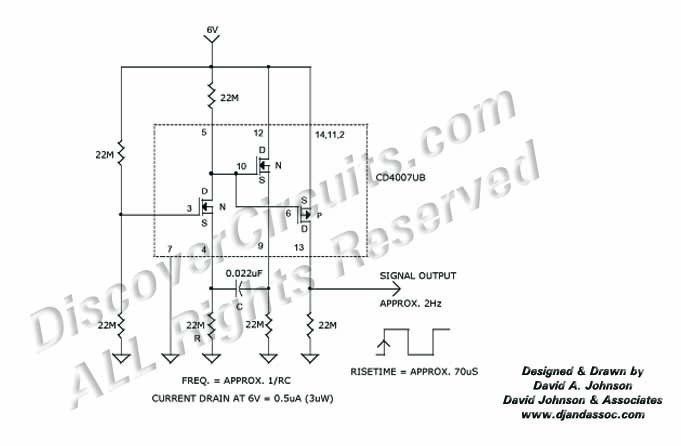 Circuit: MICROPOWER C-MOS OSCILLATOR, DRAWS ONLY 0.5uA __ Circuit designed by David A. Johnson, P.E. If truly low power oscillators interest you, this circuit draws a mere 2 microwatts (500nA) from a 6v battery. It uses a very inexpensive C-MOS IC to produce a frequency of 2Hz. However, by changing the component values you can push it to 300Hz. The circuit draws much less current than traditional C-MOS oscillators using a Schmitt trigger inverter. It also produces fast leading edges. However, if you need more drive current, a C-MOS buffer should be included. Published in EDN, Sept 2, 1993.